At some point in your life, you've probably wondered whether you're using the correct word when you're referring to those white-faced, hissing creatures that like to sneak out in the dead of night. Possum, opossum...it seems like the words can be used interchangeably—especially in North America. But are they really the same animal? Does adding an "O" to the beginning of the word make that big of a difference? 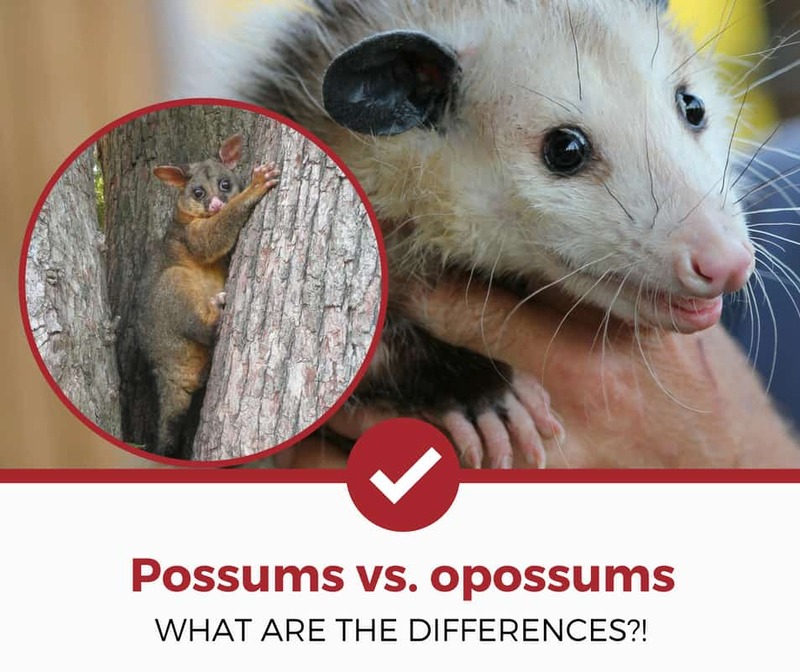 Possums vs. Opossums, What Are The Differences? Where Can You Find A Possum? Why Do People Confused Opossum with Possum? Is One Species Smarter Than the Other? Are Opossums More Dangerous Than Possums? As it turns out, these two words refer to completely different animals. While they are cousins, they last classification circle they share with each other is Infraclass Marsupialia. This means that these two animals are both marsupials, which are animals that give birth live young which they then nourish in pouches on their stomachs (picture a kangaroo—the world's most famous marsupial). Based on where you live, using the word "possum" when you really mean "opossum" can get you some pretty funny looks! Not sure what we mean? Read on for a better explanation. Want to skip all this research and just hire a decent exterminator for your opossum problem? Possums are native to Australia. However, since the 1800s, these animals have been introduced to neighboring nations such as New Zealand, New Guinea, and even China. These marsupials tend to thrive in wooded areas, but also prefer to build small rock dens if the terrain allows. They are very opportunistic and will take advantage of the benefits of the land around them, but always prefer to den in forests first and foremost. Opossums live on the North American continent, particularly on the mainland of the United States. There have been sightings of opossums as far north as Ontario, Canada; however, the extreme cold is a severely limiting factor in these animals' migration. Generally, these little guys are what many Americans call possums (without the "O"): the blacked-eyed, pointed-featured, rodent-type of animal that scurries out into the night with its babies on its back. As mentioned above, both the Australian possum and the North American opossum are marsupials, meaning that they have an external pouch on their abdomens where they care for their newborn babies until they can fend for themselves. This family tie (and the comparable namesake) are pretty much where the similarities stop for these two species. The Australian possum has a round body shape and thick fur which is often golden in color—giving it the nickname the Golden Brushtail Possum. Its eyes take on a peanut butter color in the light, and true to its moniker, its tail is thick and voluminous like that of a squirrel. These animals look more like cuddly cousins of the koala bear rather than distant relatives of the opossum. The North American opossum, on the other hand, has stark features: black eyes, a white face, jagged teeth, and a sharp, pointed face. These creepy animals skulk around waving their rat tails in the air, hissing at those who dare to come too close. This species can be found ransacking trash piles when they're not migrating from one makeshift den to another; as migrant scavengers, they feed on whatever they can find during their transient lifestyle. Scientifically speaking, you'd be hard-pressed to find an actual possum on the North American continent. By possum, we mean the cute and cuddly Australian version, of course. If you're thinking of opossums, then yes, you're going to find those all over the mainland. Still mixed up? Keep reading for a little more insight. It's not very clear why most Americans drop the "O" when referring to opossums, but it's commonly accepted in the United States to call these animals both possums and opossums. However, in Australia, there is no such thing as an opossum—and an American on holiday might be surprised to learn that the adorable little animal in the tree actually shares the same name with the garbage-eaters they've come to know back in their home country! In terms of raw intelligence, both Australian possums and North American opossums rank pretty low. However, North American opossums have evolved to develop a behavioral trait which has worked to deter predators time and time again. Essentially, they enter a comatose state and play dead for a period of time—from two minutes to two hours. This has sparked the phrase "playing possum," and keeps the animal safe from passing danger. Australian possums, by contrast, will basically just walk right up to anyone. They're a very trusting species, extremely friendly, with no problem whatsoever in becoming a stranger's new best friend. This naive behavior leads to their hunting by fur poachers and threatens them as a species. Australian Brushtail Possums (you know...the adorable ones who aren't afraid of humans) aren't known to be carriers of diseases. They won't bite or harm people, and actually have a natural (and scientifically unexplained) resistance to rabies. Opossums, too, have this resistance—in addition to other, more serious immunities. For example, did you know that an opossum can eat a rattlesnake (one of the most dangerous snakes in the USA) and digest it as if it were nothing more than a piece of garbage?? When picturing possums and opossums, many people think of disease-carrying vermin. But perhaps it's much more lucrative to picture these animals for what they really are: mysteriously gifted animals with an unexplained sense of resilience. Depending on where in the world you are right now, this information will hit you differently. Essentially, American readers will understand that there is another, more cuddly version of the rat-tailed night stalker we've come to know and despise. Australian readers will gaze in disgust at the creepy cousin of the crawling teddy bear their country has discovered. Going forward, you should be able to tell the differences now between a cute possum and a creepy opossum right off the bat...if anything, just remember what continent you're standing on, and that should do the trick. Curious about other opossum related articles? Check out our other detailed guides to help you deal with your pest problems.